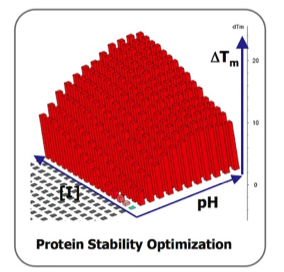 Basic characterization of the thermal stability of a protein in its native state, or in site-specific or chemically modified forms, is useful in many applications where this knowledge can frame e.g. a particular isolation or HTS screening strategy. Many proteins show pronounced differences in thermal stability depending on solution ion concentration, pH, or additional factors that can affect protein stability.